Luxury home prices grew 5.2 percent year-over-year, to an average of $1.9 million, in the second quarter of 2018 — a modest slowdown from the first quarter when prices skyrocketed 7.3 percent, according to a new Redfin study. The study, which defines “luxury” as the top 5 percent of a city’s most expensive homes, cites the passage of the “Tax Cuts and Jobs Act” in December and a robust stock market as a reason for continued growth in the luxury housing market. Those measures have allowed affluent buyers to fuel bidding wars during a period of low inventory, according to Redfin. 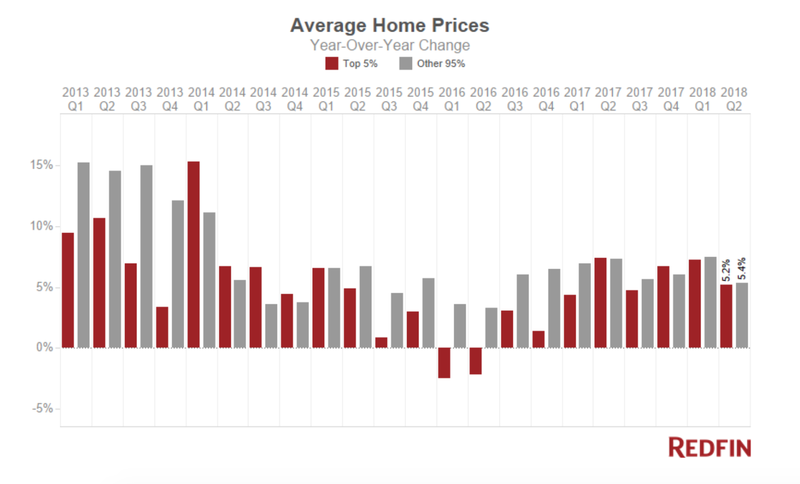 In the second quarter, the average high-end home spent 65 days on the market, the shortest time since Redfin began analyzing the data in 2009. In California, turnaround has been swift, with the average luxury home selling within 17 days in Oakland, 19 days in San Jose and 29 days in San Francisco. In West Palm Beach and Boynton Beach in Florida, luxury home prices also soared — by 85 percent and 59.1 percent, respectively. Passage of the GOP “Tax Cuts and Jobs Act” in December may be playing a role in the price hikes. In high-tax states like California, the $10,000 cap on state income and property tax deductions has served as a strong incentive for affluent homebuyers. Approximately 10 percent of recent homebuyers said they bought a cheaper home because of diminishing tax benefits on luxury houses while 8 percent said they moved to another state for lower taxes. Meanwhile, prices for homes worth more than $2 million are up by 11.4 percent, leading to increased competition among wealthy homebuyer. But such a competitive market is even more pronounced among the lower tax brackets — in June, the average cost of a single-family house rose by 6.8 percent year-over-year, to $264,800. The bottom 95 percent of homes sold in 51 days — at 26.8 percent above the sales price. With higher home prices and low inventory, fewer people are able to afford to buy. While the current market has allowed agents to sell properties expeditiously, analysts predict that unchecked growth will eventually be prohibitive for the average home buyer. Nonetheless, there are signs the housing market is gradually rebounding. Housing inventory is up 5.7 percent for homes worth more than $350,000 while luxury home price growth is now also down 2.1 percent from the first quarter of 2018. “The good news is that inventory declined at a slower rate last quarter, which has alleviated some of the upward pressure on prices, resulting in slightly lower price growth in the luxury market last quarter,” Bokhari said. Thinking of bringing your team to Luxury Connect? There are special onsite perks and discounts when you buy those tickets together too. Just contact us to find out more. Article image credited to Photo Credit Daniel Barnes on Unsplash.